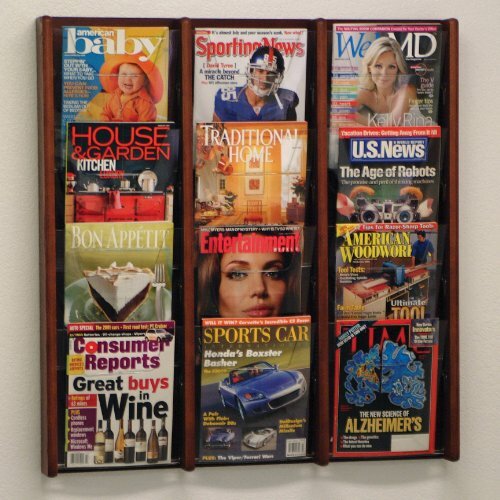 Discount Medical Depot's beautiful displays will showcase your literature in style. Designed to hold your literature up straight without having corners of the paper curl over, the combination of clear corner supports and curved and tilted faces keep even light single sheets standing straight. Our innovative overlapping shelves allow you to display more literature in less space. We offer furniture quality construction with solid oak uprights and clear acrylic shelves. Made in the USA. Designed to hold your literature up straight without having corners of the paper curl over, the combination of clear corner supports and curved and tilted faces keep even light single sheets standing straight. Our innovative overlapping shelves allow you to display more literature in less space. All displays are fully assembled and complete with hardware for simple wall mounting. Each pocket measures 9" wide. If you have any questions about this product by Discount Medical Depot LLC, contact us by completing and submitting the form below. If you are looking for a specif part number, please include it with your message.